Many have the idea that hell is a place where wicked people end up and where they are then tormented for eternity. Where do these ideas come from? They turn out like many traditions which come from Greek mythology. We'll want to consider that a little later, but first let's look at the word “hell” itself. To take a closer look, we'll need to do a word study. The first thing we should do is go to the first place in Scripture where the word “hell” itself is used. It turns out this law of first discovery varies depending on the translation of Scriptures. Isn't it a dead giveaway that the word may not be the best translated word to use in these verses? Let's take a look at them. 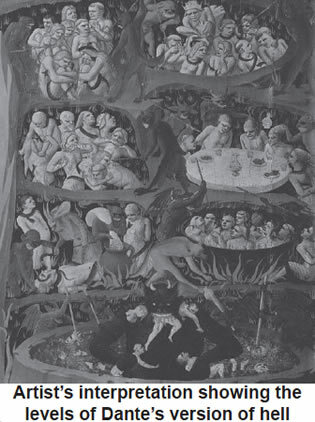 The “lowest hell” gives images today of multiple levels of fiery torment. Even a level of purgatory is taught and is promoted today by some. Though there isn't much to laugh about, the first major publication to put forth the idea was most likely the Divine Comedy by Dante in the 13th century. In his writings, he has 9 levels before one gets to the bottom, and Satan is in the lowest 10th level where the most wicked go. 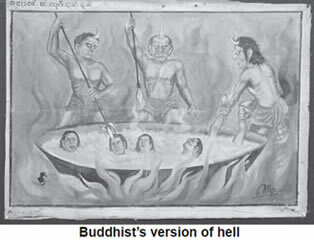 Others pick up on this type of imagery and draw pictures, which become the way they think about hell. There are various images from cultures, such as Islamic and Buddhist, which give similar images of what they think hell is like. Ultimately, Deuteronomy 32:22 fits well, if we consider hell as a fiery tormenting abode for the wicked. But, is that the right way to think about it? Going all the way back to Genesis, the following translation is from the Latin Vulgate. It tells of Jacob relating his grief over the believed loss of Joseph his beloved son; it is also one of the first times the word “hell” is used. And all his children being gathered together to comfort their father in his sorrow, he would not receive comfort, but said: I will go down to my son into hell, mourning. And whilst he continued weeping, Genesis 37:35 Douay-Rheims 1790 Bible. So, did Jacob believe that his good and beloved son was doomed to hell? And that he, himself, was planning on joining him? According to some of the existing images of hell, it doesn't seem like a nice place to go. The wicked shall be turned into hell, and all the nations that forget Elohim. All nations, could as well be said, all and any of the peoples. In all three of these verses, Deut. 32:22, Gen. 37:35 (Douay-Rheims 1790), and Ps. 9:17, where the word “hell” has been translated from sheol, and the images of ‘hell,” today, are burned (no pun intended) into our minds as a fiery abode in which Satan and his demons torment condemned souls, we find the original word teaching us something else. "7585 [shâ'owl,shâol/ sheh•ole/] n f. From 7592; TWOT 2303c; GK 8619; 65 occurrences; AV translates as ‘grave’ 31 times, ‘hell’ 31 times, and ‘pit’	three times. 1 sheol, underworld, grave, hell, pit. 1A the	underworld. 1B Sheol—the OT designation for the abode of the dead. 1B1 place of no return. 1B2 without praise of [Elohim]. 1B3 wicked sent there for punishment. 1B4 righteous not abandoned to it. 1B5 of the place of exile (fig). 1B6 of extreme degradation in sin," Enhanced Strong’s Lexicon. In it we find the pronunciation, and how many times it is used, and also an alternative word that is sometimes used. However, their definition of the word appears to be siding with common beliefs of hell being a permanent abode of punishment with no way out. “She'ol (#7585), ‘place of the dead.’ Sha'al seems to be the basis for an important noun in the Old Testament, she'ol. Found 65 times in the Hebrew Bible, she'ol refers to the netherworld or the underground cavern to which all buried dead go. Often incorrectly translated ‘hell’ in the KJV, she'ol was not understood to be a place of punishment, but simply the ultimate resting place of all mankind (Gen. 37:35)." The wording here is different than the Hebrew wording for sheol. The wording here is literally “the lake of fire (limni tou puros)” in the Greek. When doing word studies in the Hebrew and Greek, you can often get a sense of the Greek word by going to the Septuagint, which is a translation of the Hebrew Old Testament Scriptures into the Greek. The word in the Greek for the Hebrew word sheol, when doing a comparison, is hades. Hades, as you're probably aware of, was popularized by pagan Greek myth by some of Dante's descriptions of hell with fire and brimstone, in which the wicked are tormented day and night. Movies, like Clash of the Titans, brings up this pagan mythology and the idea of Hades, the Greek god of the underworld. There is actually a statue of him in the Museum of Archeology located on the island of Crete, in the city of Heraklion. Is hades, as related in the New Testament, any different than sheol in the Old Testament? What is the reality of Yahweh's Word compared to the traditions	that have been handed down to us by pagan teachings, which were adopted by well-meaning, or not so well-meaning, believers in a heavenly Father and His Son, our Savior? It was surprising to see the NASB actually choosing to not use the word sheol here, but rather hades, when the quote is directly from the Hebrew in Psalm 16:8-10. Going back to it, they use the word sheol in its correct location. The definition we find originally of sheol here hasn't changed when going to the New Testament. It still means the GRAVE for the DEAD. The passage was a prophecy of the Messiah being raised from the grave. His spirit He gave up, but Yahweh returned it so that He became alive. He was dead, then made alive. It’s a resurrection that took place, the same kind of resurrection that will happen to all mankind who die a first death. We can go deeper into these words later, but I would like to take a look at another word in the Greek which is also translated “hell” in some translations, but is neither the word sheol nor hades. Rather, it is the word gehenna. The significance of gehenna being used in the 1st century is that it doesn't just have meaning, but is an actual location which people knew about. And if thy hand may cause thee to stumble, cut it off; it is better for thee maimed to enter into the life, than having the two hands, to go away to the gehenna, to the fire— the unquenchable—where their worm is not dying, and the fire is not being quenched, Mark 9:43–44 YLT. Sound pretty serious? An unquenchable fire? A few years ago we kindled a fire here at the assembly grounds to get rid of fallen branches and other debris which had accumulated over time. Plus, that's when we had downed a few trees and had those branches included on the fire. To say the least, it was a large fire. When it was realized that it was a bit too large, we put the hose to it. But it was so intense that the water wasn't able to quench it. We had to let it burn down on its own. We hear in the news of similar fires where firemen choose to let the fire burn out on its own. The point is that a fire can be so hot and big that it can be unquenchable. In figurative and even literal thought, it can be speaking of a fire that will ultimately not be put out until it has completely burned up everything in it. As was mentioned, this Greek word gehenna didn't just have a meaning, but also told of a place. Unlike the Hebrew word sheol and the parallel Greek word hades, the place described as gehenna would ultimately be pointing to the lake of fire in the future. As a place of destruction, everyone in the 1st century knew what gehenna was. Literally, it meant a fiery garbage dump. "1067	[geenna	/ gheh•en•nah/] n f. Of Hebrew origin 1516 and 2011; TDNT 1:657; TDNTA 113; GK 1147; 12 occurrences; AV translates as ‘hell’ nine times, and “hell fire + 3588 + 4442” three times. 1 Hell is the place of the future punishment called ‘Gehenna’ or ‘Gehenna of fire.’ This was originally the valley of Hinnom, south of Jerusalem, where the filth and dead animals of the city were cast out and burned; a fit symbol of the wicked and their future destruction," Enhanced Strong’s Lexicon. Can you imagine a place like this and the flies that would be there along with maggots eating the things on the edges that didn't make it in all the way, or the scraps of rotting meat or other produce on the edges from thousands of things thrown in by the various people? More	things would be thrown in, more scraps laying around and more flies would lay their eggs, so that indeed, the worms never died there. Further research reveals more information so we can get a proper image of what certain words mean over other words that have other meanings. “The mouth of hell." That would be quite the sight - an image others would have had literally of the place called gehenna, but wouldn't have had with the word sheol. And he hath defiled Topheth, that is in the valley of the son of Hinnom, so that no man doth cause his son and his daughter to pass over through fire to Molech. This is what King Josiah, one of the good kings of Judah, went through. He had to clean this up, along with breaking down the Asherah poles and other false images of worship. The worship of these false gods, like Baal and Molech, went all the way back to before Solomon's time when he himself built up such things for his foreign wives who would not part with their pagan practices. But, the idea of an all consuming fire would have been in the minds of those who heard the word Gehenna spoken. The reality is that it was a place of destruction, but not a place of everlasting torment. Everlasting hellfire has been brought down to us by myths and fables. Yahweh Himself gives evidence that He is not going to torture people, but He will utterly destroy those against Him. “Now I will arise,” says Yahweh, “Now I will be exalted, now I will be lifted up. You have conceived chaff, you will give birth to stubble; My breath will consume you like a fire. The peoples will be burned to lime, like cut thorns which are burned in the fire," Isaiah 33:10–12 NASB. This was speaking of Israel of old, whose fruit was like chaff and stubble at times. Such is the punishment of the coming tribulation. A day of wrath and consuming fire upon those who are not doing what Yahweh has commanded. It reminds us of the branches mentioned in the New Testament about those at that time who would not bring forth good fruit, so they are broken off and thrown into the fire. Branches do not burn forever. They can be completely made into ashes. Sinners in Zion are terrified; trembling has seized the unrighteous. “Who among us can live with the consuming fire? Who among us can live with continual burning?” (Isaiah 33:14 NASB). See also Malachi 4:3. The idea that an everlasting fire or a continual burning is just stating that there is utter destruction of whatever is in it. This is how it was understood. It is not a torture chamber for all eternity, administered by a merciless Creator who wants suffering without an ending for those who would stand against Him. A good example of a figurative translation, like "eternal hellfire," being something more than the reality of what is spoken of, is found in the book of Jude. In a similar way, Sodom and Gomorrah and the surrounding towns gave themselves up to sexual immorality and perversion. They serve as an example of those who suffer the punishment of eternal fire, Jude 7 NIV. Everything we know of in Scripture points to a resurrection of the dead. The cities of Sodom and Gomorrah are not in hellfire suffering in torment. They did, however, suffer the punishment of “eternal fire.” That is the reality. They were utterly destroyed in the fire Yahweh put upon them. The results were “eternal” until they are resurrected and told what is what. In other words, they will be told the truth of Yahweh's Word which they may have never heard before. Notice what the Savior says to someone who did receive witness and evidence of Yahweh's Word, but rejected it. Woe to you, Chorazin! Woe to you, Bethsaida! For if the miracles that were performed in you had been performed in Tyre and Sidon, they would have repented long ago in sackcloth and ashes. But I tell you, it will be more bearable for Tyre and Sidon on the day of judgment than for you. And you, Capernaum, will you be lifted to the heavens? No, you will go down to Hades. For if the miracles that were performed in you had been performed in Sodom, it would have remained to this day. But I tell you that it will be more bearable for Sodom on the day of judgment than for you, Matthew 11:21–24 NIV. How could it be more bearable for Sodom, the dominant city of the cities destroyed during Lot's time, if they are in hell (that is, an ever burning fire) already? Scripture doesn't contradict itself, but sometimes our understanding fails to see the truth of it, until it is revealed. This is a parable, which ultimately relates to us as believers. We are responsible for what we know; we're also responsible for what we don't know, as there is judgment meted out accordingly. But the point is judgment, for whomever is judged by the Just Judge, will be, in part, according to the knowledge of the individual. Yahweh is not going to throw mentally disabled people, for example, into a destroying fire. If anything, He'll heal them, and then share the truth with them; He will be giving them an opportunity to know what is truth, and what is error. Right now, we're being given that opportunity. This is why Yahshua, knowing what judgment will be like, said it will be more tolerable for some and not for some others, on the day of judgment. Some, at this point, might point to purgatory or the so called different levels of hell. But those concepts were from paganism, and there is a belief, even now, that the eternal fire will cleanse those that go through it. They believe they'll come out the other side, cleansed. This may be indeed true about the tribulation or other difficulties we go through that can build our character, but when it comes to the lake of fire, the things that enter there will cease to exist. There is no other side of the lake of fire. That is a pagan myth. Interestingly enough, even hades will be thrown in at the end. This will happen after the 2nd resurrection. The sea gave up the dead that were in it, and death and Hades gave up the dead that were in them, and each person was judged according to what they had done. Then death and Hades were thrown into the lake of fire. The lake of fire is the second death, Revelation 20:13–14 NIV. Death and Hades will be thrown into the lake of fire. Hades, as we've seen, is the equivalent of the Hebrew word sheol. Sheol and hades both have the meaning of the grave or covering. The death and the graves that held the dead, will be no longer. No more death and no more suffering. It will all be coming to an end, and it is called the second death. It's a finality and cessation of the life of anyone or anything thrown into it. For if Yahweh did not spare angels when they sinned, but cast them into hell and committed them to pits of darkness, reserved for judgment. He's pointing out the fact that the same standard in heaven and in the Old Testament, obviously, stands in the New Testament and beyond. Yahweh doesn't change. But, in this verse, we have the word “hell,” which brings images of Dante's Inferno to mind, with fire coming up from below where men and women are tortured eternally. The Greek word for “hell” here is tartaroo or tartaroos. The word used for “pit” here actually means chain or rope, as in a restraint. For if Elohim did not spare the messengers who sinned, but sent them to Tartaros, and delivered them into chains of darkness, to be kept for judgment, 2 Peter 2:4 TS. "5020 tartaroo, from Tartaroos, (the deepest abyss of Hades); to incarcerate in eternal torment:— cast down to hell." The depictions of eternal torment and casting down to hell bring up images of the traditional hellfire concept. However, this verse is simply speaking of a type of holding cell (as explained by Peter) for certain angels. We're not told why they are being held there, just that they are. Though this might possibly be a general statement for all angels, it might be speculated here that this could be fallen angels, who, having listened to Satan, recognized this had been the wrong course of action which never should have happened. By choosing not to work with Satan any longer, Yahweh may have placed them in limbo, so to speak, until a time of judgment. Since 1,000 years is like a day to Yahweh, maybe it's not such a long wait for these spirit beings. Nevertheless, we know the end of the fallen angels that continue to work with Satan. Even they appear to know what their end is. And there was in their synagogue a man with an unclean spirit; and he cried out, saying, let us alone; what have we to do with Thee, Thou Yahshua of Nazareth? Art thou come to destroy us? I know Thee Who Thou art, the Holy One of Elohim, Mark 1:23–24 KJV. Interesting that this man was in an assembly and, yet, he had a demon. There are a couple ways of looking at this fallen angel's statement and question. One, that there is more than one demon in this man. And two, it is one demon, but he's asking if destruction is going to be imminent for all the fallen angels out and about. The point is, both ideas indicate destruction, not an everlasting torture. The Lexham Analytical Lexicon to the Greek New Testament shows the word tartaroo has a literal meaning: (tartaroo¯), hold in Tartarus." The literal wording without commentary can give clarity over commentary. However, the following commentator seems to recognize the Greek pagan connection to the word. The Holman New Testament Commentary says, concerning the word tartarus, "The name in classical mythology for the subterranean abyss in which rebellious gods and other such beings as the Titans were punished." This is evidently what was believed by many in the first century, but the reality of "hell," as defined in the Old Testament, only had the meaning of grave or covering. As mentioned, in the New Testament we are given the word hades, which means the same. We are told about a lake of fire, and used to describe that, by Yahshua, was the place called gehenna. However, this word tartaroo, though possibly used for emphasis to imply a place of punishment, is to be understood in the context of the whole as a type of restraint until judgment can take place. Judgment hasn't taken place yet, and, as mentioned, the saints are destined to even judge the angels. Whether or not these angels are the ones, we just aren't sure at this point. What's amazing about all this is the saints of Yahweh will be given, not only kingship and priesthood in the Kingdom, but will also share in delegation of judgment. The reward outweighs any difficulty we must go through at this time of overcoming. Do ye not know that the saints shall judge the world? And if the world shall be judged by you, are ye unworthy to judge the smallest matters? Know ye not that we shall judge angels? How much more things that pertain to this life? (1 Corinthians 6:3 KJV). We've talked before about the promise of sitting on Yahshua's throne for those who overcome. Do we truly understand and appreciate what is being offered? In all of this, we need to take a closer look at the translated word “hell” and what is commonly taught, compared to what Scripture teaches us. The reason being, if the saints are going to be judging even angels, they had better know the truth that is spoken of in its pages, the very words breathed by Yahweh's own mouth. There is one other Hebrew word we'll want to take a look at. The Greek wording: limni tou puros, literally "lake of fire," is quite close to gehenna in meaning, but there is a close counterpart with the Hebrew word abbadon, in the sense that it means destruction. The Eerdmans Dictionary of the Bible says, "ABADDON (Heb. ?a?b?addôn) The 'place of destruction,' from the verb ?a¯b?ad?, 'to perish' or 'to fail.'" If my heart has been seduced by a woman, or if I have lusted for my neighbor’s wife, then let my wife belong to another man; let other men sleep with her. For lust is a shameful sin, a crime that should be punished. It is a fire that burns all the way to hell. It would wipe out everything I own, Job 31:9–12 NLT. This word is actually attributed to Satan as the destroyer (Rev. 9:11), but in all that we've looked at, it does not point to Satan ruling in “hell” and tormenting lost souls as images often show. Changing gears a little, we'll want to consider one of our Savior’s parables: The Rich Man and Lazarus, starting in Luke chapter 16:19. For this, we can read through the whole parable, and then go back to the beginning for a closer examination. Now there was a rich man, and he habitually dressed in purple and fine linen, joyously living in splendor every day. And a poor man named Lazarus was laid at his gate, covered with sores, and longing to be fed with the crumbs which were falling from the rich man’s table; besides, even the dogs were coming and licking his sores. Now the poor man died and was carried away by the angels to Abraham’s bosom; and the rich man also died and was buried. In Hades he lifted up his eyes, being in torment, and saw Abraham far away and Lazarus in his bosom. And he cried out and said, “Father Abraham, have mercy on me, and send Lazarus so that he may dip the tip of his finger in water and cool off my tongue, for I am in agony in this flame.” But Abraham said, “Child, remember that during your life you received your good things, and likewise Lazarus bad things; but now he is being comforted here, and you are in agony. And besides all this, between us and you there is a great chasm fixed, so that those who wish to come over from here to you will not be able, and that none may cross over from there to us.” And he said, “Then I beg you, father, that you send him to my father’s house— for I have five brothers— in order that he may warn them, so that they will not also come to this place of torment.” But Abraham said, “They have Moses and the Prophets; let them hear them.” But he said, “No, father Abraham, but if someone goes to them from the dead, they will repent!” But he said to him, “If they do not listen to Moses and the Prophets, they will not be persuaded even if someone rises from the dead,” Luke 16:19– 31 NASB. This all appears to be quite clear that there is no problem in understanding that the rich man is in “hell” (hades, to be exact) being tormented because he never listened to Moses or the Prophets, and didn't help the poor. The poor man is named Lazarus (In the Hebrew, would have actually been Eleazer, meaning "Elohim has helped."). But, he didn't have much of anything, and, in addition, was evidently crippled and considered an outcast because of it. And He answered them, “To you it has been given to know the secrets of the kingdom of heaven, but to them it has not been given. For to the one who has, more will be given, and he will have an abundance, but from the one who has not, even what he has will be taken away. This is why I speak to them in parables, because seeing they do not see, and hearing they do not hear, nor do they understand, Matthew 13:11–13 ESV. We have to put all parables in context with Yahweh's Word to be able to better understand them. We do this with all areas of the Bible, especially with unclear verses, as we often find in the Apostle Paul's writings or, for example, in the book of Revelation, in which there is often figurative language mixed with the literal. "...it is impossible to ground the proof of an important theological doctrine on a passage which confessedly abounds in Jewish metaphors." Jewish metaphors? Let's consider the parable from that stand-point and see what we find. Now there was a rich man, and he habitually dressed in purple and fine linen, joyously living in splendor every day. And a poor man named Lazarus was laid at his gate, covered with sores, and longing to be fed with the crumbs which were falling from the rich man’s table; besides, even the dogs were coming and licking his sores, Luke 16:19–21 NASB. If we look at this from a 1st century viewpoint, we can then ask, "Who walked around to show off and to be seen, who had wealth to flaunt and loved to sit in places of honor?" From a Jewish stand-point, "Who also closed the gate on those humbly begging to enter the coming kingdom?” It was the Pharisees and teachers of the law. Their preaching didn't match their practice. Dogs were considered gentiles, but as they were being called back to Yahweh, they desired to know the Word of Yahweh, which the crumbs from the food on the table could have certainly been related to. Yet, the so-called Rabbis wouldn't allow them near the Temple, but rather kept them out. "No man of another nation to enter within the fence and enclosure round the Temple and whoever is caught will have himself to blame that his death ensues." 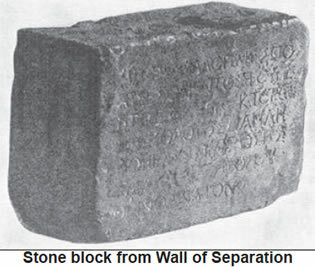 This stone inscription is now located at a museum in Constantinople, Turkey. The Apostle Paul wrote about this very wall which was up, preventing the nations, other than Judah, to approach and be within the Temple grounds. For He Himself is our peace, Who has made both one, and has broken down the middle wall of separation, having abolished in His flesh the enmity, that is, the law of commandments contained in ordinances, so as to create in Himself one new man from the two, thus making peace, Ephesians 2:14–16 NKJV. This is an area of Paul's writings that people will take and say, "See, he has said the law is done away with. It is abolished in Messiah." However, to be noted, the word "enmity" used here is actually the word "dogma," which in context, no matter where you see it used in the New Testament, is telling of "man-made rules and commandments." Not Yahweh's commandments mind you, but rather man's laws. "...the wall that separated the Court of the Gentiles from the Court of the Jews in the Temple. An inscription warned Gentiles of the death penalty of going beyond it," Ryrie's Study Bible. Not to digress too far from the subject, but we need to understand what Paul was saying, when he said, Yahshua is creating "in Himself, one new man from the two." Now, therefore, you are no longer strangers and foreigners, but fellow citizens with the saints and members of the household of Elohim, Ephesians 2:19 NKJV. That at that time ye were without Messiah, being aliens from the commonwealth of Israel, and strangers from the covenants of promise, having no hope, and without Elohim in the world, Ephesians 2:12 KJV. What's another way of saying "household of Elohim"? Another way is saying, "The commonwealth of Israel." That is, the whole house of Israel, all 12 tribes. He's speaking about the mystery of bringing the lost tribes back with Judah, in Messiah. That is the wall that is still coming down. Now the poor man died and was carried away by the angels to Abraham’s bosom; and the rich man also died and was buried. In Hades he lifted up his eyes, being in torment, and saw Abraham far away and Lazarus in his bosom. And he cried out and said, “Father Abraham, have mercy on me, and send Lazarus so that he may dip the tip of his finger in water and cool off my tongue, for I am in agony in this flame," Luke 16:22–24 NASB. Here, both men had died. And both were buried, when we consider Gen. 15:15, in which Yahweh said Abraham would be buried at an old age. It's intriguing that the word Hades is used here in Luke, a word that, in the minds of the heathen, would have produced images of torment and torture from the deepest parts of “hell,” even though it may just be a translation of the word sheol, meaning grave. Nevertheless, his eyes lifted up, which strongly indicates being resurrected. Which resurrection though? Evidently, the second one. Though this parable is not trying to get the timeline laid out for us. We'll find it's relating a more significant message as we go along. But how do we understand this parable at this point? Is it literal to think that someone's finger could be put into an eternal fire to quench it? Isn't the lake of fire unquenchable? What if we were to think of the fire in the sense of a confession on the day of judgment? Each one’s work will become manifest, for the Day will disclose it, because it will be revealed by fire, and the fire will test what sort of work each one has done, 1 Corinthians 3:13 ESV. “Revealed by fire.” If one has lived outside of Yahweh's will all their life, then how intense will the revelation by fire be? The tongue may also be very significant here in this parable, because with it, confessions are made. That at the Name of Yahshua every knee should bow, of things in heaven, and things in earth, and things under the earth; and that every tongue should confess that Yahshua Messiah is Sovereign, to the glory of Elohim the Father. But Abraham said, “Child, remember that during your life you received your good things, and likewise Lazarus bad things; but now he is being comforted here, and you are in agony. And besides all this, between us and you there is a great chasm fixed, so that those who wish to come over from here to you will not be able, and that none may cross over from there to us," Luke 16:25–26 NASB. Would this have hit home with the Pharisees and other Rabbis hearing this? They are collectively the ones who made up a wall of separation (a type of chasm) keeping the Gentiles (a type of Lazarus) out of the Temple area. We see pretty clearly that Yahshua is pointing to them in this parable. It certainly fits with how He dealt with them in other areas when speaking of them and to them. He was not at all happy with them and neither was John the Baptist. But when he saw many of the Pharisees and Sadducees coming for baptism, he said to them, “You brood of vipers, who warned you to flee from the wrath to come? Therefore bear fruit in keeping with repentance; and do not suppose that you can say to yourselves, 'We have Abraham for our father’; for I say to you that from these stones Elohim is able to raise up children to Abraham. The axe is already laid at the root of the trees; therefore every tree that does not bear good fruit is cut down and thrown into the fire," Matthew 3:7–10 NASB. Saying "Abraham is our father" may have been what the Pharisees and others kept saying. It's another reason to think this parable is about them. And he said, “Then I beg you, father [Abraham], that you send him to my father’s house— for I have five brothers—in order that he may warn them, so that they will not also come to this place of torment.” But Abraham said, “They have Moses and the Prophets; let them hear them," Luke 16:27–29 NASB. Five brothers? It's nice when investigating a particular subject matter to have the pieces fall into place. We'll want to look at something back in Genesis. Back to the sons of Jacob, whose name was changed to Israel. The sons of Leah: Reuben (Jacob’s firstborn), Simeon, Levi, Judah, Issachar, and Zebulun. The sons of Rachel: Joseph and Benjamin. The sons of Bilhah, Rachel’s servant: Dan and Naphtali. The sons of Zilpah, Leah’s servant: Gad and Asher. These were the sons of Jacob who were born to him in Paddan-aram, Genesis 35:23–26 ESV. From Judah's perspective, he has five brothers. This is another fitted piece of the puzzle for whom this parable is focused as far as the rich man goes. Eleazar, the other man, is the one who gets help from Elohim. That is what his name means. But he said, “No, father Abraham, but if someone goes to them from the dead, they will repent!” But he said to him, “If they do not listen to Moses and the Prophets, they will not be persuaded even if someone rises from the dead,” Luke 16:30–31 NASB. One has risen from the dead, and what does He say about Moses? Then Yahshua said to the crowds and to His disciples: “The teachers of the law and the Pharisees sit in Moses’seat.S‎‎o you must be careful to do everything they tell you. But do not do what they do, for they do not practice what they preach," Matthew 23:1–3 NIV. Whom was Yahshua speaking to? He was speaking to those He was close to and everyone else who could hear Him. What is He telling everyone? There is much confusion over what we should be doing and what we should believe today. The whole idea of the word "hell," for example, has been taken to mean an everlasting torturous place in which the damned are going to suffer forever in unbearable pain and anguish. Not a very nice image, and not a very true one, either. We could get into the false “immortal Soul” teaching (see our mini-study, "Do You Have an Immortal Soul? "), but we should already understand the clear verses of Scripture say the dead know nothing, zilch, nada (Eccl 9:5), and they are actually asleep until resurrected, John 11:11-14; Revelation 20:5. Behold, all souls are Mine; the soul of the father as well as the soul of the son is Mine. The soul who sins will die, Ezekiel 18:4 NASB. May Yahweh give grace and have mercy on us, as we obey Him and have accepted His Righteous Son's sacrifice to make atonement for our sins, truly a proper covering and protection to keep us safe and out of the lake of fire.